It's Five Minute Friday when I link up with other writers. We get a one-word prompt and get to write for five minutes flat. Our word for this week is VALUE. 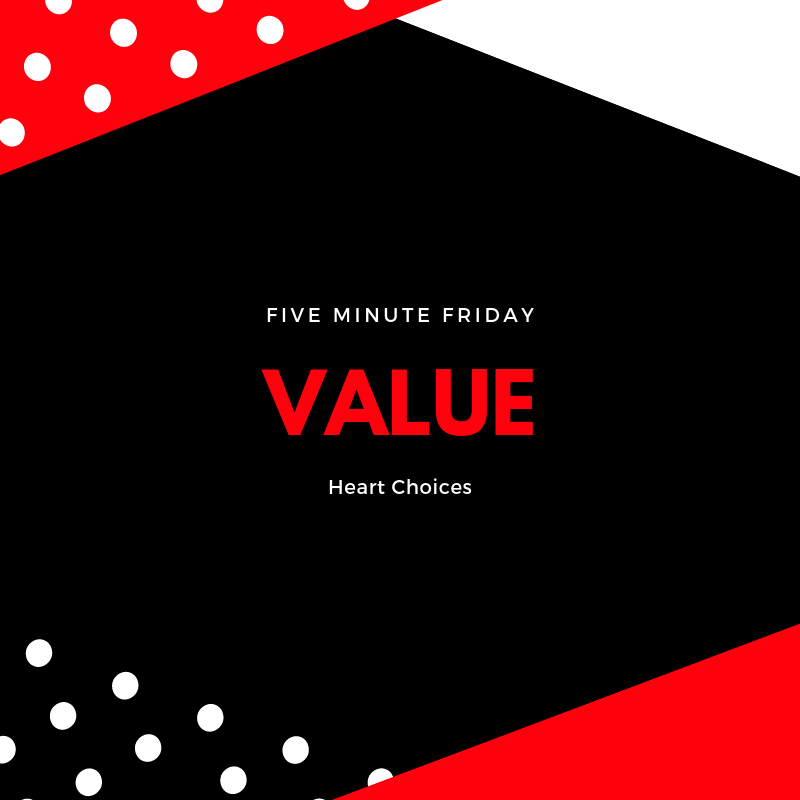 The word value brings to mind something that is important. I've heard it said that you can easily see what's important to you by looking at your receipts or your checkbook log. We usually spend money on what we value most. Yesterday was Thanksgiving; a time to celebrate with friends and family and to feast on turkey and the fixings. I love this holiday because it focuses on thankfulness. But I watched the local news last evening and discovered that many people waited in line all day to secure their spot for Black Friday deals. I felt sad to think they would miss out on a day of thanks so they could purchase a great deal. I think of my own family. Most of them live across the country in Florida while I'm here in Phoenix. My dad is currently in a Rehab facility after a fall injuring his back. He needed more intense Physical Therapy to rehabilitate him for his hopeful return home. I spent the day with my husband, Greg. I bought two turkey dinners from a local gourmet grocery store (AJ's), and we grazed all day. I made frequent phone calls to my dad throughout the day, watched the Macy's Thanksgiving parade, and thanked God for my many blessings. I value God, my faith, family, and my health. I get to teach little children and write in my spare time. I have life-long friends and a church family. I'd say that's something to value. You made me want to go look at my checkbook register. Ha! ha! We value what we spend our time on and I am with you on feeling sad about Black Friday madness. Debbie, it was nice to meet you through your blog. Yes, I never forgot that when I heard my pastor say it. We spend time and money on what we value. I agree, it's sad if people are missing out on the time with family to wait in line for bargains. It says a lot about what they really value. I love your list of things you value- those are the important things to me too! Yes, Lesley, our culture has its values upside down, don't they? That's so sad to hear about everything people are missing out on! Thanks for sharing about your Thanksgiving! In Germany, we don't get a day off, but I still invited friends over in the evening and we enjoyed good food, great company and thankful hearts. It certainly sounds like you know what's important and value people above things.